Then I noticed a small flat plastic gizmo about the size of a fingernail in the wire. I unscrewed the wire nut that was connecting the little wire from that gizmo to the power and measured 120v coming from the fan itself. So the little whatchamacallit was keeping the light from coming on. What was that thing?!! Whenever I have a question I do what people down through the ages have always done: I whip out my smartphone and Google it. The only problem was that I didn’t know what to type in. Even Google wouldn’t come up with relevant results if I typed in “thingamajiggie.” I was still up on the ladder and could see there was some kind of part number written on it so I typed in “Y59 R 130C” (or “Y59 B 120C” which is a similar device) and the first hit was an article titled “The light on my ceiling fan stopped working, could it be the wiring harness?” Apparently someone else (actually lots of someones else) had a similar problem. It turns out that piece of plastic is a wattage limiter that is supposed to restrict how much power goes to the bulbs. In my case it worked pretty well because it restricted the wattage to 0, which is some pretty significant energy conservation but on the downside the room is dark. So I cut that wonderful piece of technology out of the circuit and connected the wire for the light bulbs directly to the power wire using the wire nut. Now when you turn on the wall switch the light comes on. Between installing ceiling fans and repairing them, it seems that I spend a lot of time on a ladder since I am rather “height-challenged,” which I believe is the current P.C. term for my stature or lack thereof. Fannie Mae is always concerned for my safety when I climb a ladder because she says, “Don’t fall off,” which is frankly not a new thought to me. It’s not like I wake up one day and get this great idea to fall off a ladder but she scuttles the plan by saying, “Don’t fall off.” Anyway, it is nice that Fannie Mae cares about my safety. She seems to be hedging her bets, though, because she is very conscientious about paying the premiums for my life insurance. Another one on the pile for the ole Y59. We have two of these in our bonus room. Finally took time to troubleshoot this and found good voltage, good switch and in swapping the light units knew the issue was in the lower unit. Google the fan component in the light base and ruled that out since fan is working fine. Next found Y59 and swapped it out and the lights come on! This is the second article I found on this issue but nicely we have the wonderful comments on purpose, cost and how to bypass so I am going for the bypass and using LED bulbs. Thanks Gary and everyone who commented. Great stuff here! You crack me up! I had just done everything you did to get my fan lights back on and had the offensive little thing in my hand where I could read the printing (under the now working lights). Googled Y59 R 130C and opened your article. I re-read it to my wife “Fanny Sue” and laughed at how exact of a description was of my last half hour! Thanks so much, really appreciate you spending the time to write this up. My hunter fan had the same problem. My wattage limiter was an overachiever and limited all power. Hunter wired it so that I could just unplug and Plug the wiring without the wattage limiter.! Been watching YT videos and got excited about fixing this stupid light which has been replaced THREE times in as many years and I’m not DOING it again. Since the videos showed unplugging the light part from the fan in one fell swoop, that was really encouraging and I’m pretty good at following directions, even though I am very respectful of anything electric! Looked so easy… even though I think a lot of men understand electrical stuff more than most women (of which I AM one), just because they’re used to doing these types of thing, it really DID look doable to bypass that little culprit with the letters on it. However, MINE isn’t “pink” wires, like the videos show and though ONE side of that little box has a wire that has the plug into the OTHER plug (simple) the OTHER wire off that stupid little thing DOESN’T. It wires into one of those wire nuts along with two more (one black and one grey), so NOW I’m not sure what I need to do. Any ideas would be appreciated! Will LED bulbs work ok without the limiter? For those actually wanting to purchase one Hunter did send me a price. $15 plus $7.99 shipping. Obviously trying to avoid. LED bulbs will work fine. LED bulbs pull way less wattage than old school bulbs. Wattage is actually like amps, it is the amount electricity that your bulb pulls. So if you put a higher wattage bulb than recommended then the limiter is sure to go out. So with LEDs you will not even get near the watts the limiter was trying to limit you to in the first place. Lol. Wow. I hope that makes since. When I remove the limiter from the circuit, should I remove the 20 Ga wire and connect the larger two wires together – or just connect the vacancy where the limiter previously resided? I had figured out that power stopped at the limiter, but could not figure out if it was a small capacitor that was necessary or not. Glad you posted this sir! Either way should work but I just connected the two large wires together. Enjoy the light! I have two Hunter fans model #51028 that I bought in 2013. Last month the lights went out on one of them. I called Hunter and they told me that the only way I could get the wattage limiter was to order the harness assembly. I ordered one and was waiting on it to come in and it was back ordered. Last week the other one went out. Today I called Hunter and cancelled the harness assembly. I removed the wattage limiter and lights work. There is a you tube videos that shows how to do this. Pull Chain Switch = O.K. G@@D W@RK — it would have <lessened MY anxiety if I had READ first — BEFORE — cutting out the WATTAGE Limiter ! Thanks for this. Kept me from going a buying another fan. Thanks for this article. Like everyone else, I had a bad wattage limiter and bypassed it, but unfortunately not before replacing the light pull-switch. Wish I’d have had the wherewithal to have Googled the wattage limiter which brought me to your page. At any rate if any of our other Hunter fans lights go out, this will be the first thing I check/bypass. Can I remove this piece for my fan Y 59 R 130 c? Yes. It is similar to the Y59 B 120C. 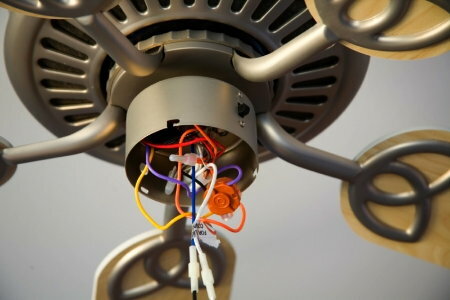 1) the multi-strand heavy gauge wires coming out of the fan was spliced to the watt limiter’s minimal gauge wire. Seems to me that the minimal gauge wire for the limiter is more of a fire hazard than allowing more than 190w. 2) my fan’s light kit came with two candelabra style sockets. The maximum wattage light bulb available for those sockets is a 60w bulb so that the light kit is limited to 120w. So, what is the purpose of the 190w limiter, if the max light bulb wattage for that type of socket is 120w? Oh yeah, while the limiter was in place, there wasn’t enough light in the room to read very well. Take out the limiter, and the two 60w bulbs are putting out significantly more light than they were. The limiter was apparently limiting the wattage to the sockets even though the wattage was less than 2/3 of the limiter’s maximum. I’d be laughing if the joke wasn’t on me. I have a hunter with the limiting capacitor y59 r 130c b03* 38711 (lights not working) . 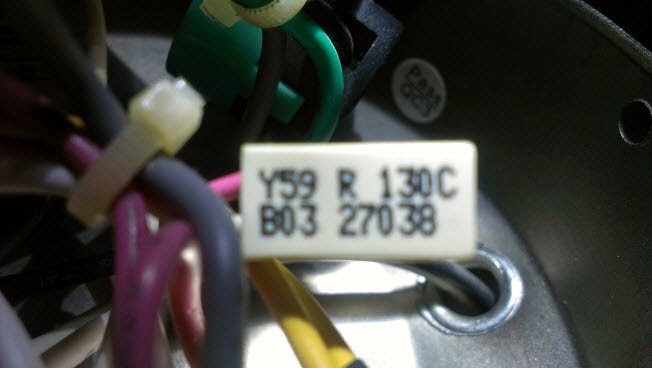 I have a black w/ white stripe wire that is seperated by this capacitor one pink wire & one white wire each connected to the black w/white stripe wire ends. Can I just remove this capacitor w/pink&white wires, then connect the 2 ends of the black w/white stripe wire ? Will I have lights without any kind of fire hazard ? Yes, as long as the bulbs aren’t higher wattage than the limit printed on the label of the light fixture. It was the same 120v candelabra bulb that was in it before the limiter blew. I imagine that it was just a bad bulb. It got very bright when I first switched it on, then started to smoke inside, it turned white inside the clear glass, then blew. Strange. 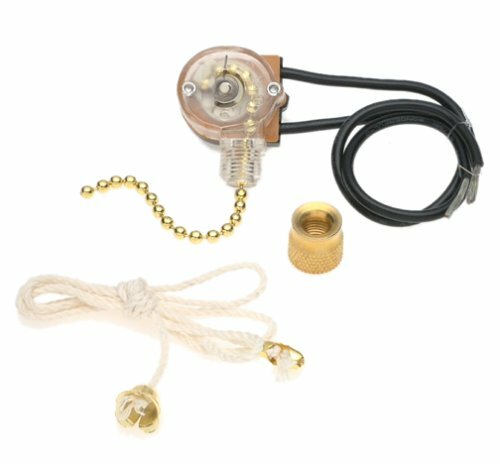 I also read in another thread that these pull chain switches in Hunter ceiling fans are “fake switches” that just send a signal to the limiter to turn on/off the lights, and must be replaced when omitting the limiter. Is there any truth to that statement? It ohms out just like a regular switch. Smoke inside the bulb suggests that there was also oxygen inside the bulb, which of course is not supposed to be there. All incandescent bulbs require a vacuum (or an inert gas) so that the element won’t burn. A “fake switch” limiter would have to have at least fourwires to function that way: 1) power in, 2) power out, 3) the control wire from the “fake switch” and 4) its ground. The limiter I described in the article only has 2 wires (power in and out) and therefore the pull chain is a true switch. I successfully omitted the “Two Wire” wattage limiter from my hunter ceiling fan. Went to Walmart and picked up a six pack of 40w candelabras for 2.98. Took the limiter out of the circuit, connected the two wires together, turned the circuit breaker back on, hit the light switch, success!! Working lights on my ceiling fan! I am now in the process of contacting Hunter to see about ordering a replacement wattage limiter. Thanks for your input!! That’s great news! Glad I could help. I have the same problem and found exactly what you found. When I cut out the wattage limiter, the two wires that where left was one black wire from the pull switch, the other was coming from the plug wire. I connected those together, turned on the switch from the wall, the light did come back on, but blew the light bulb (one 40w bulb) I mean it melted that bulb pretty good. Did I do something wrong connecting the two wires? How did you wire your two wires? Did I need 3 bulbs in instead of just one? It sounds like you connected the two black wires together correctly. One possibility is that you used a 12-volt bulb instead of a 120-volt bulb. That would certainly blow it out with extreme prejudice. Another possibility is that the bulb was simply bad. If you’d like, you can send a photo of the melted bulb to gary@GarysFix.com. I would be curious to see what it looks like.